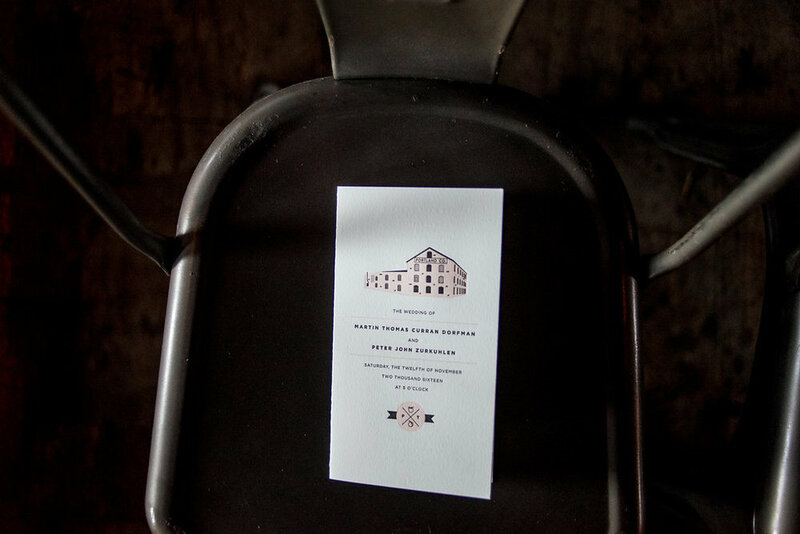 Peter + Tommy got married at The Portland Company, a beautifully rustic venue with gorgeous copper details. The ceremony took place underneath intricate lanterns and the reception space was filled with round and long wooden tables. Peter and Tommy wanted something very modern in blush, black and copper. Their main invitation came in the form of a booklet wrapped in a blush belly band and black wax seal. We designed their wax seal with a peach and an apple to represent the couple's hometowns! Guests received a fun map of the wedding events, which also featured their monogram. It's always fun to re-use details like the monogram in both your invitations and day-of pieces.